DoD Org Chart: What Is It? A DoD org chart refers to the organizational framework of the Department of Defense of America. It belongs to the U.S. department of the federal government. The main duty of DoD is to ensure coordination and supervisions for all agencies of the government. The headquarter of DoD is in Arlington, Virginia, the Washington, D.C. You may not be heard about that DoD has the world highest number of employees with almost 1.3 million. You can see one example of the DoD org chart below. The above DoD org chart template shows you the overall framework covering individual division. Right at the top is the Office of the Inspector General of the Department of Defense. Following the down-side, you can see more sub-divisions such as The Joint Staff, The Headquarter Marine Corps, DoD Field Activities and the Combatant Commands. Keep in mind that this DoD org chart only shows you part of the overall DoD Field Activities for simplicity. The history of the DoD started with the Continental Congress in 1775 with the creation of the American Army. Nowadays, both the Navy and the Marine Corps are separate sub-departments of the American Navy. After the World War II, President Harry Truman pointed out a unified department of national defense. The old DoD org structure generated too much military expenditure and inter-departmental conflicts. The National Military Establishment was the former body of DoD, which has a three cabinet-level structure. OSD is the principal staff part of the Secretary of Defense. The key role of the team is to set policy, do resource management, and oversight with other U.S. Government agencies. OSD also provides support for the management of the Defense Field Activities. The national intelligence services operate under the jurisdiction of the Department of Defense. Each of the military services, even for the Department of Defense, has their own intelligence issues. Department of Defense builds and manages the Intelligence Community’s satellite assets. JCS offers suggestions about daily security issues for the Secretary of Defense and some other related national agencies. Further duties of JCS covering assist the chairman and some other officers in the DoD. 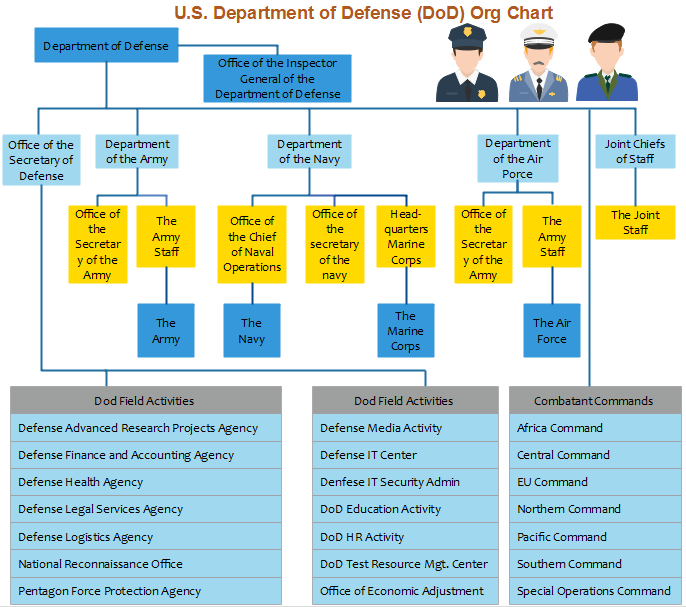 How to Create a DoD Org Chart Like This One? Simply go to Org Chart Creator for more details. Alternatively, feel free to use this easy org chart creator for more advanced settings and management of your business teams.